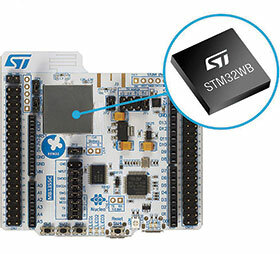 STM32WBx5 dual-core wireless microcontrollers (MCU) from STMicroelectronics come with Bluetooth 5, OpenThread and ZigBee 3.0 connectivity combined with ultra-low-power performance. Fusing features of ST’s STM32L4 Arm Cortex-M4 MCUs and in-house radio managed by a dedicated Cortex-M0+, the STM32WBx5 is power-conscious yet capable of concurrent wireless-protocol and real-time application execution. It is ideally suited to remote sensors, wearable trackers, building automation controllers, computer peripherals, drones and other IoT devices.